Usually just a bunch of silly crap. 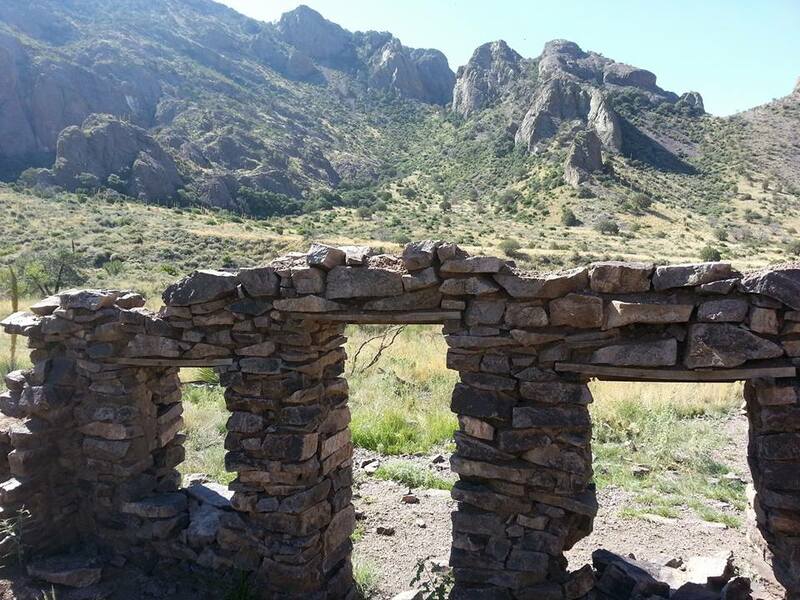 It was not until I arrived in Las Cruces, New Mexico that I had a true understanding of what hiking the Baylor Pass would entail. I had done some research during the week of preparation leading up to my somewhat spontaneous lark through the “Land of Enchantment.” All hobbies have their respective subcultures of enthusiasts posting a plethora of information over the Internet. Hiking is no exception. 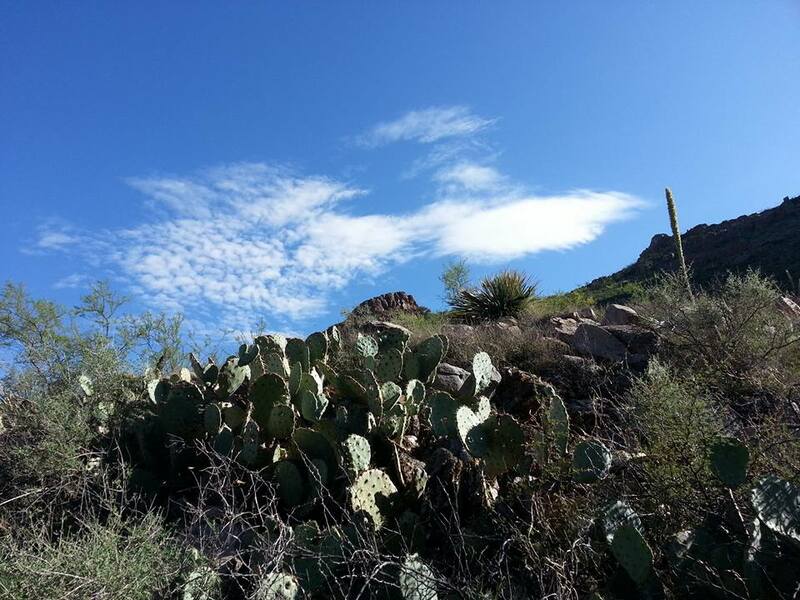 I had managed to pick out five hikes that seemed doable considering my relative inexperience as a hiker and the limitations of a compact economy car. Four wheeling was certainly out of the question. I had three days to work with. On the first, I traversed the dunes of the White Sands National Monument, following a staked out trail within the vast expanse of white, gypsum sand. As I worked my way from the parking area populated by casual picnickers huddled under shelters and children on saucer sleds skimming the dunes, I found myself in complete isolation within the sandy, sun-baked void. Distant mountains formed a 360-degree border along the horizon to the otherwise endless basin. For an hour, I felt like a wayward legionnaire lost on Luke Skywalker’s planet. On the second morning, I hiked the Soledad Canyon, experiencing Chihuahua Desert flora up close and exotic rock formations from afar. A natural waterfall, off-the-beaten-path scenery, and remnants of a stone cabin were among the highlights. The surroundings made for a beautiful morning stroll. It made sense to save the most rigorous hike for last. 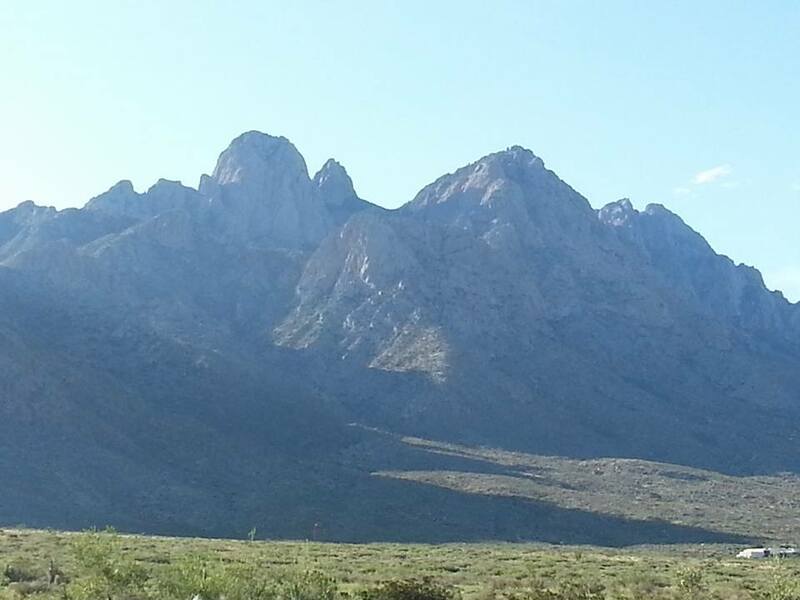 The Organ Mountains dominate the skyline of Las Cruces to the east. Vertical striations give them a resemblance to a pipe organ, hence the name. 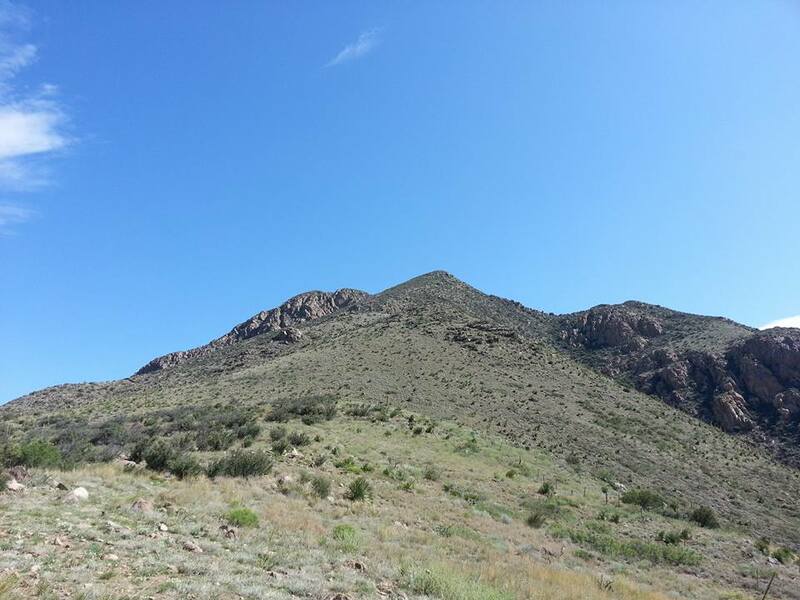 Climbing Baylor Pass would entail a 1600-foot ascent between two notable features: the dual peaked Rabbit Ears formation and Baylor Peak. During my evenings, I would research the local attractions and hikes. 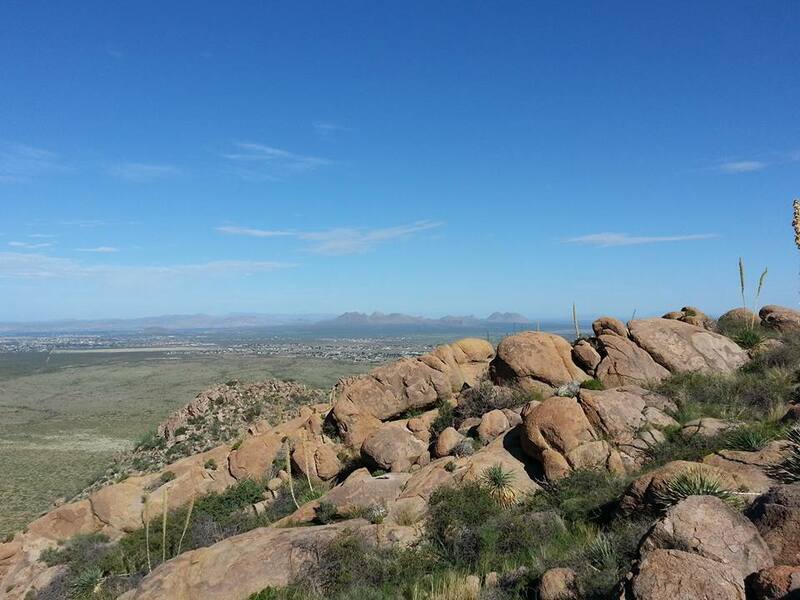 Internet reviews noted that the scenery was awe-inspiring and the climb was achievable if one were in shape. People mentioned that they brought their children and pets along for the hike. Nevertheless, the heat, the sun, and the elevation were among the challenges. Starting early in the morning would minimize some of these concerns. A hat, sunglasses, sunblock, water, and a well packed knapsack would be among the necessary provisions. Being that my hometown elevation is in the area of 400 feet above sea level, altitude was a significant factor. I had been running and hiking in higher elevations during the three days previous, so I had been doing what I could to become acclimated. I was not overly concerned with this. 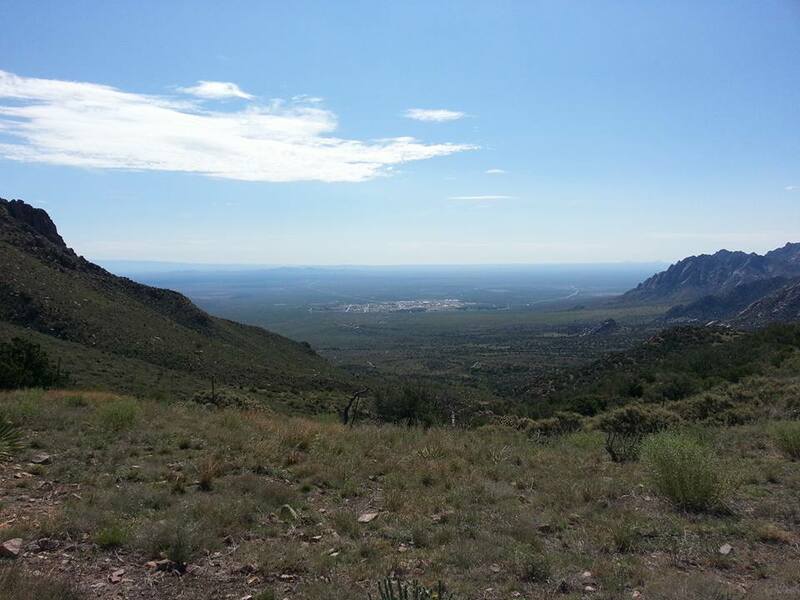 After a light breakfast and a 20-minute drive out of Las Cruces, I arrived at the trailhead. I was greeted by this ominous sign: Snakes???? Although I had some experience handling snakes, the thought of encountering one in the wild was somewhat unsettling. I was okay with them if I knew they were benign, as long as somebody assured me they were not poisonous or would not hurt me. If only they were color-coded — like green for good, red for bad — it would give me some comfort. I supposed if I heard any rattling in the woods, it would be a pretty good signal to get the hell away. A family of four arrived at the lot moments later and took off ahead of me while I was purposefully lacing up my hiking boots and applying sunscreen. This provided me some comfort in that I would not be on the mountain alone. As fate would have it, the first thing I saw when I set foot on the trail was a snake. 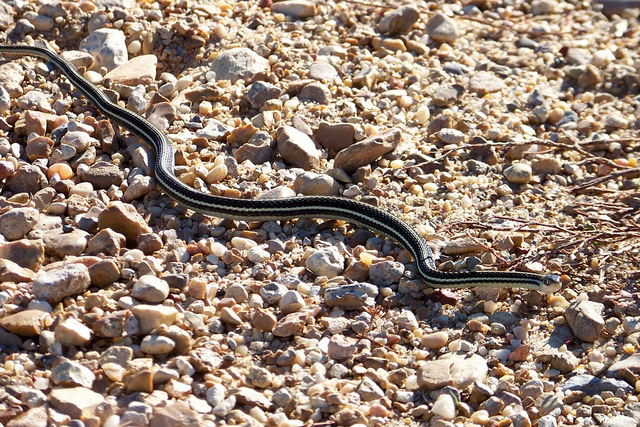 It was a ribbon snake, I would later determine, moving away from me in pursuit of a lizard. Its head was held about three inches off the ground like a periscope, its slender body propelling it quickly along the path with low-amplitude oscillations. I determined it was no threat to anybody other than the lizard and pressed forward. The “approach” to the mountain was nearly a mile long. 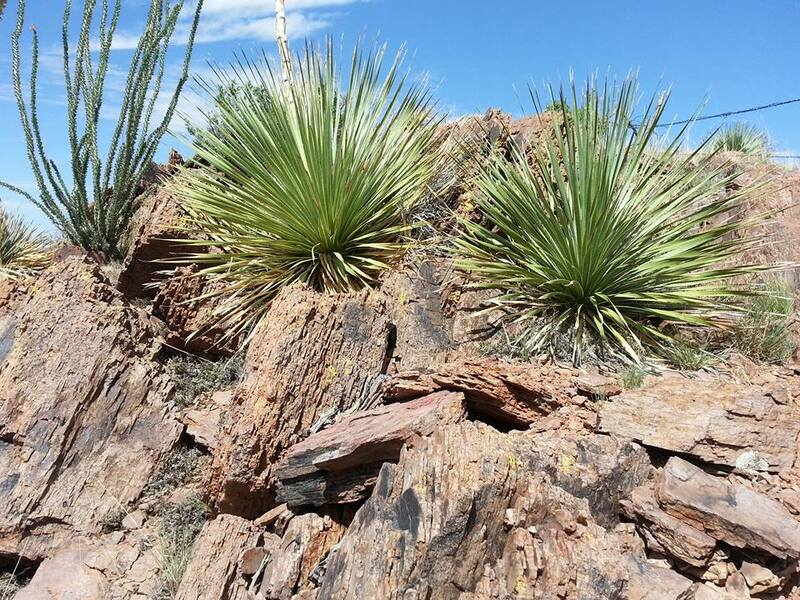 I would stop on occasion to snap pictures or to enjoy the Chihuahuan desert flora. After passing a number of sticks, perhaps planted as a trail marker, the ascent up the mountain began. A short while later, I encountered the family I saw at the trailhead. They were in what I figured to be a dry creek bed, basically a rock-lined gully that would accommodate the downhill flow of water in the event of rain. They were confused about the markings on the last trail post. I found the place where the trail continued on the other side and walked up a bit. “The trail continues here,” I said. “Where does this go?” he asked. “Okay. Thanks!” The father replied. As I walked away, I could hear one of the boys making a case for pressing forward. I figured he would be overruled and, thus, I would be alone thereafter. I continued along the well-worn path upwards, becoming increasingly conscious of the effects of the thin air upon the oxygen supply in my bloodstream. I seemed rather winded for the amount of work I was doing. Afterall, I was in pretty good shape. I had been to the doctor ten days earlier. My blood pressure was about 117/73, and I had accomplished the resting “runner’s pulse” of 51 as the result of speed training with a local track club. I have just run a 10K the weekend prior to leaving town. Other than needing to lose a few pounds, I was in excellent shape. Nevertheless, I was laboring a bit in the higher elevations. I plopped down on a convenient trailside bench to catch my breath and drink a swig of water. One of the Internet reviews of this trail mentioned the occasional bench. I noticed that recovery came swiftly with a little rest and pressed on. Again, I encountered the dry creek again. As I crossed, I had difficulty finding where the trail picked up, much like the family I encountered earlier. I walked up the ravine a few yards, then down, unable to find the trail. I saw what looked like a worn spot along the perimeter of a large bush. I walked about 20 feet then became convinced I was most certainly not on the trail. 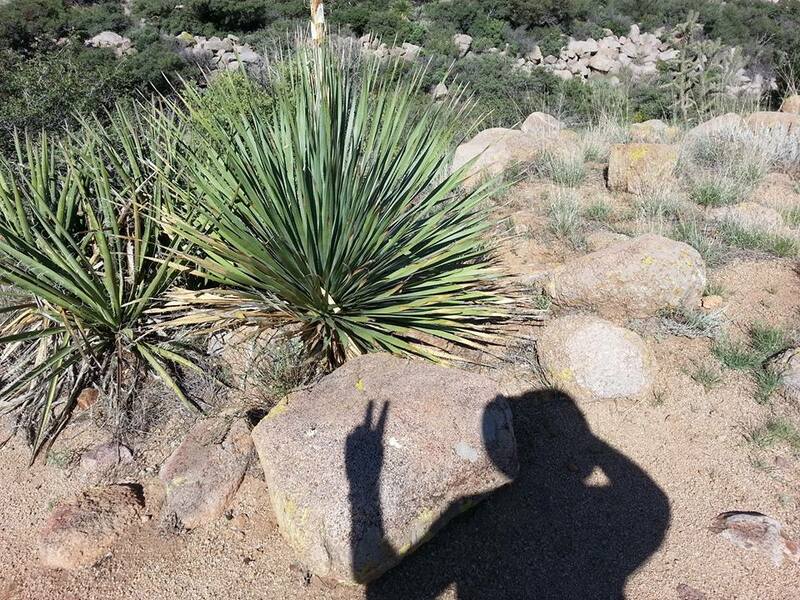 I returned and tried a different route, only to get poked by pointy plants and getting my shirt snagged on thorns. If the rest of the trail were like this, I would be out of my mind to continue, I thought. I would be lost in no time flat. Eventually I found myself back in the dry creek bed, about 20 feet upstream from where I had started. I walked, bounded, slid my way downhill until I found the place where I had entered. This whole process had taken up 15 minutes or more. I concluded, with great disappointment, that I should turn back. I was heartbroken. As I retraced my steps, I thought about what I could do. It was about 9:20. I had planned to be immersed in this project at least until noon. I figured I could still muddle about for a while and enjoy the scenery. Soon I found myself walking upwards to the left while seeing the bench where I had rested downwards to the right. What was this? I am back on the trail? I looked back to see that the trail had switched back before meeting the creek. I must have wondered off on a side route earlier. My spirits immediately lifted! I saw a women approaching from below near the bench. She was thin and tanned. She wore a turquoise tank top, blue bucket cap, and sunglasses, apparel consistent with hiking. I pressed on. In a few minutes, a saw how four rocks along the side of the trail indicated a left turn. There was also a path going towards a cliff. I decided to check it out. 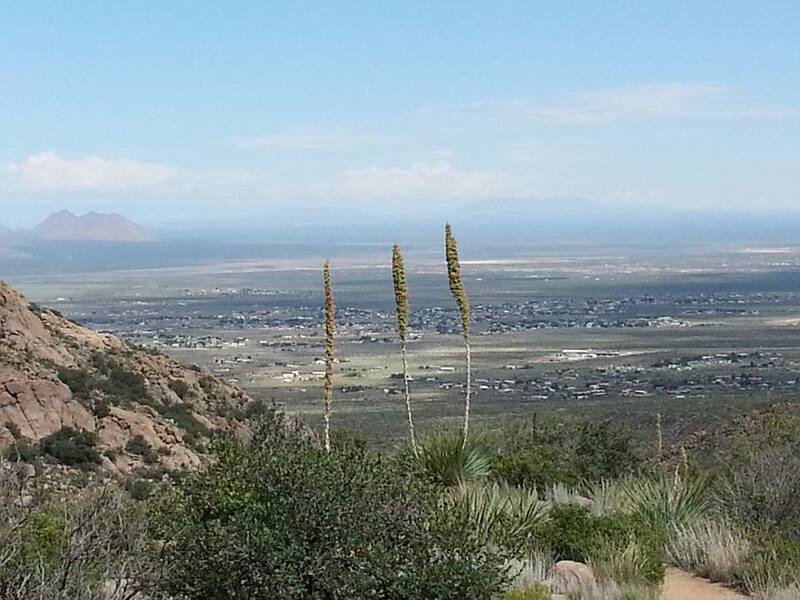 I saw the town of Organ, New Mexico below me and pulled out my phone to snap some pics. “That’s the wrong way,” I heard behind me. It was the woman in the bucket cap. She moved on. I returned to the main trail and followed. The course became rather rocky, just as she had mentioned. Every once in a while, I’d see her pop up briefly along the route above me. I pushed myself to keep within visual range of her; she was, more or less, my guide. But the woman was moving quickly. And she was not stopping to take pictures. I could literally hear my heart pounding as I worked harder, climbing higher and higher. Eventually I would have to stop and catch my breath, and I would take some pictures while I was idle. Recovery still came rapidly during breaks. About 2/3 the way up, I saw what appeared to be a fire pit with a sign indicating it was “Baylor Pass Primitive Camp.” There were other signs attached to the same post, but they seemed to be either weather worn or burnt. I pressed on. Suddenly I became aware of my stomach growling. Perhaps this would be a good time to get into my snack, I thought. I had heeded the advice of the hiking experts to always pack some food in case I ended up on the trail longer than anticipated. I had a package of beef jerky and a bag of grapes stashed in my backpack . . . so I thought. As I rummaged through my bag’s multitudinous pockets and zippers, it occurred to me that I had no memory of actually removing these items from the cooler in my car. A more thorough search revealed that I had no food whatsoever. Plenty of water, but no food. I briefly panicked, then remembered running marathons for four hours – a much more draining activity — without eating. This hike shouldn’t take much longer, I thought. I put my hunger pangs out of my mind and they were no longer an issue. I recalled the event that gave Baylor Pass its name. John Baylor was a Confederate Colonel who led 200 men over the Organ Mountains to mount a surprise attack on the union soldiers below. I imagined hundreds of men weighed down with artillery and provisions traveling the same route without the benefit of a well-worn trail. It seemed quite remarkable. The whole time I was traveling upwards, I was clueless as to my end destination. There was no obvious pass above me, just several high peaks. 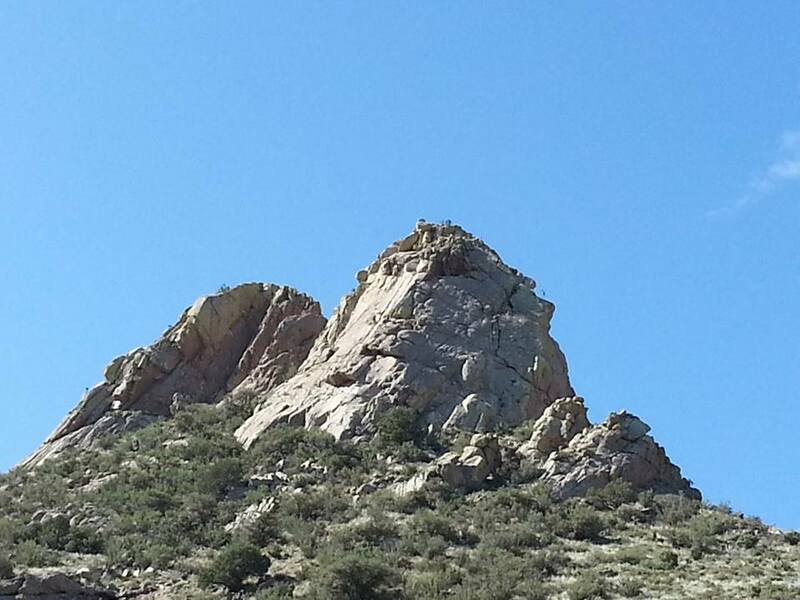 The dual peaked Rabbit Ears hovered above me to the right for most of the journey. 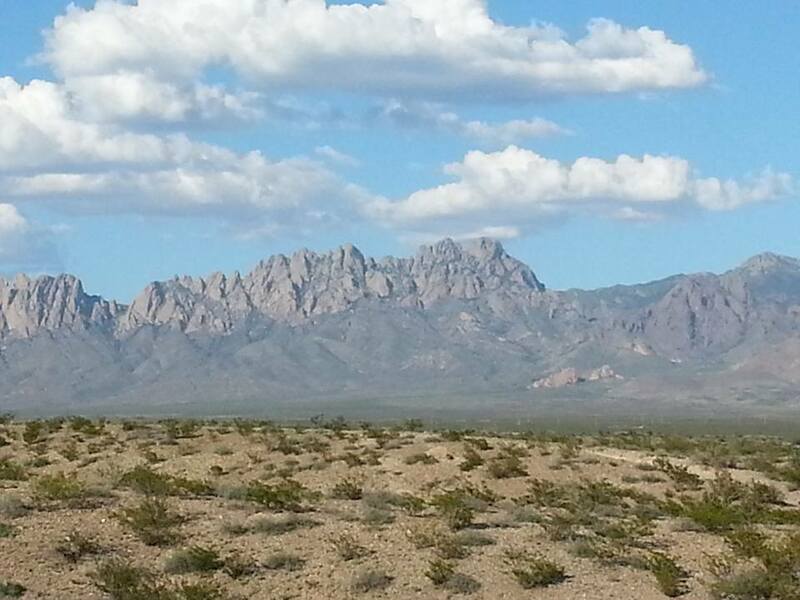 It appeared as if the peak had fractured sometime in the remote pass forming the noteworthy landmark recognizable for miles around Las Cruces. 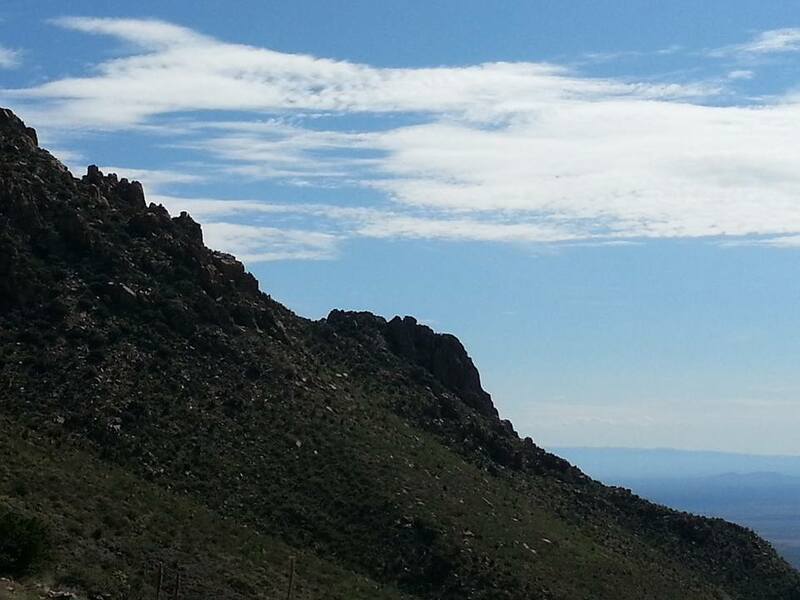 Eventually I passed Rabbit Ears, it being among the organ-piped western peaks, only to find others in front of me. I hadn’t seen my guide for a while. “Ultimately, where are we going to end up?” I would ask if I saw her given the opportunity. As it approached the two-hour mark, I turned a corner and noticed what could be a plateau approaching ahead of me. Could be. It was still a ways ahead of me. Just as the woods became a thicker, I noticed a blueish roadrunner ahead of me. 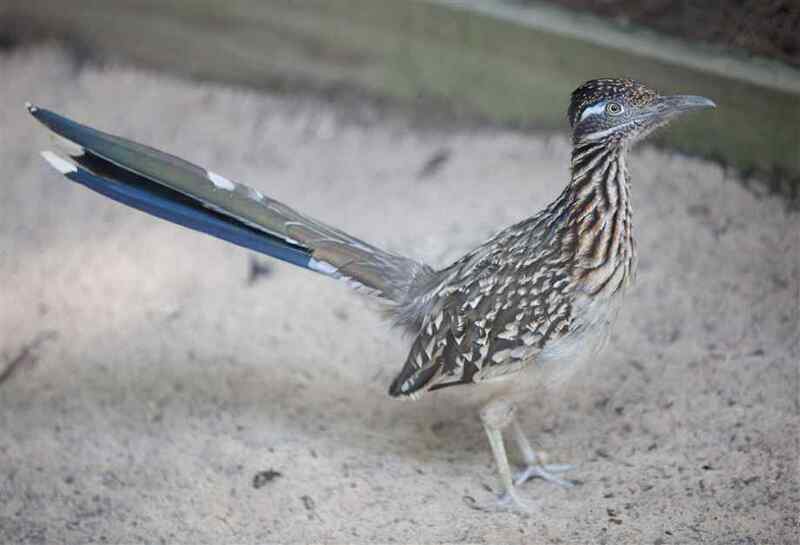 I had never seen one before, but judging by its anatomy, it just HAD to be a roadrunner. I thought of the obvious Wyle E. Coyote jokes. I envisioned him strapping himself to an ACME rocket and crashing into one of the peaks. The roadrunner skipped away just as I emerged from the woods. The sky seemed to have opened up above me. I walked up a small incline in the clearing to see the whole Other Side of the Mountain below me. I had made it! For a moment, I surveyed the great openness before me. What I figured to be Baylor Peak was to the left of me, towering a thousand feet above. As one’s eyes followed the peak downward, it appeared to abruptly and dangerously drop off at a great distance below me. 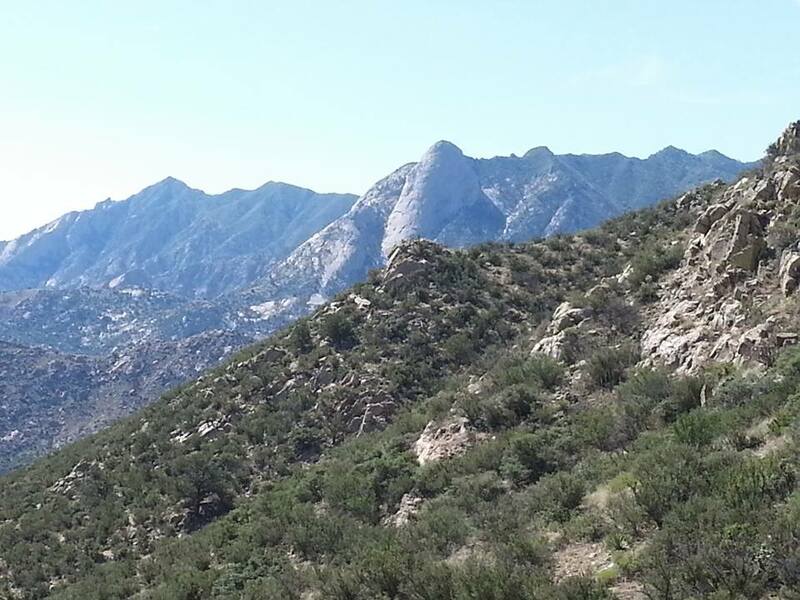 Another peak was to the right above me, and the bare cuspid-shaped Sugarloaf Peak could be seen in the remote distance. Straight ahead in the valley below, the small town of White Sands lay before me. Unlike the town of Organ on the west side, which was spread out and lacking distinct boundaries, the streets of White Sands presented a tight formation in the middle of the desert floor. I noticed a barbwire fence a few yards downhill from me. As I approached, the woman in the bucket hat emerged. “Good luck!” she shouted with a wave. I waved back thanking her. 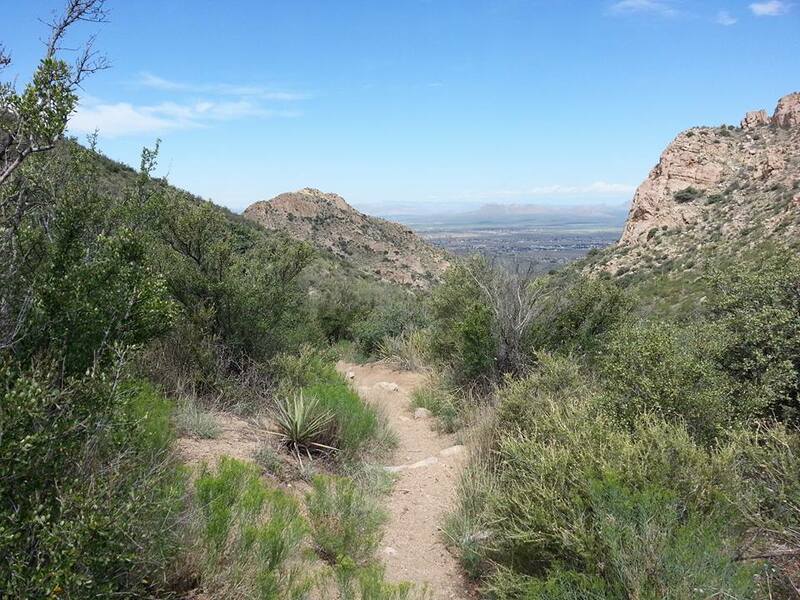 She disappeared down the trail, presumably headed towards the eastern trailhead at Aguirre Springs. I wondered if she would hike the whole 12-mile roundtrip or if she arranged for somebody to pick her up on the other side. There was an opening in the barbwire fence where one could gain access to the other side by navigating a small maze. I assumed this was to keep motorcycles and horses from crossing the pass. I snapped some pictures, drank some water, and took in an extended rest as I admired the scenery. The whole ascent took about two hours, ten minutes, including the 15-20 minutes I lost the trail. Pretty much right on target. Eventually, I decided to start the journey back. I climbed back to the passes crest and began my descent back in the direction I came. I almost forgot to take a selfie from the top. 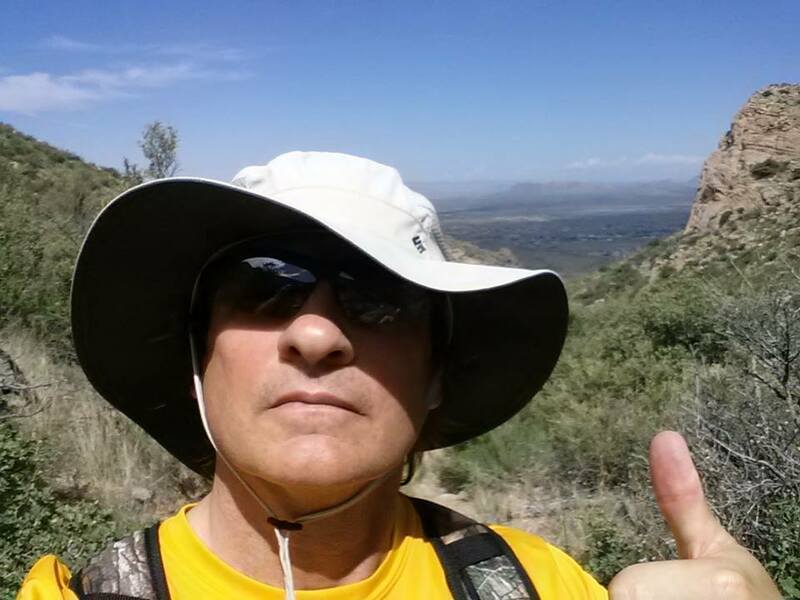 I snapped a pic giving a thumbs up with Organ, New Mexico in the background. 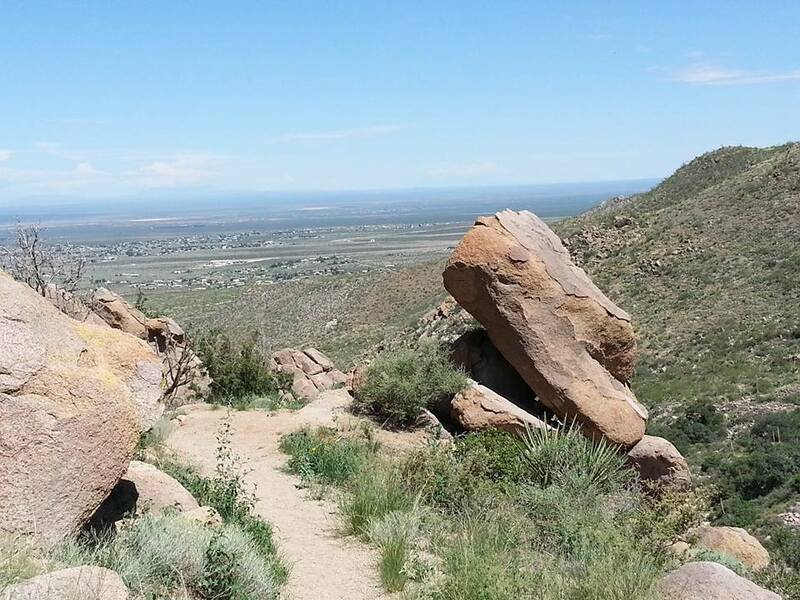 I assumed that it would not take me as long or be as strenuous on the way back down. I was making a good easy pace, though I did notice my knees taking some abuse from semi-rocky trail below. Inflammation and tenderness was beginning to present itself in my left knee. Nevertheless, I descended at a good pace. My brother texted me to inform me he was going to the gym. “Are you still in Elk City?” he asked. “That’s not Affton!” he replied. I became aware of the sky getting increasingly cloudy. There was a wet coolness in the air. Concerned that I might get poured on, I picked up the pace a bit. 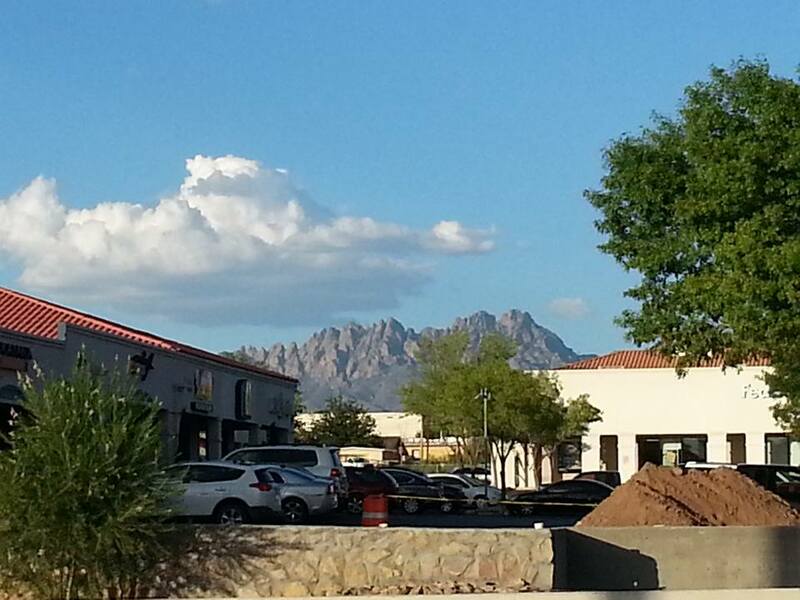 There was one cloud approaching that looked like a rain cloud. I concluded that any rain on the mountain would be hit or miss, but I would need to be wary of the creek if there were a downpour. After all it was “monsoon” season. Given I was hanging out in a city without storm sewers, the local conception of monsoon may be quite different from mine. Nevertheless, I continued downward with a rigorous pace. Then I heard it: the unmistakable buzz of a rattlesnake. I caught a glimpse of the critter out of the corner of my eye, about 15 feet down the trail, while doing a reflexive about-face. I determined it to be less than fully mature due to its slender body. It was dark brown and black, probably a diamondback. Unlike the ribbon snake I encountered earlier, the rattler did not elongate its body when moving. Instead, it moved like a pile of rope in retreat. I suspected this was to keep itself coiled in case it needed to strike. The sound was bonier in timbre than what I have grown accustomed to on TV, which was, in all likelihood, the result of a Foley artist snapping castanets post-production. This was the first rattler I had encountered in my life. As fearsome as the experience was, I concluded that the rattling was a “courtesy” lacking in other snakes, like our home-grown cottonmouths, thereby rendering them less dangerous. So I now had a problem. I never saw the snake leave the trail and had no idea where it was. I still needed to get down from the mountain. I entertained the idea taking a detour and avoiding the area where the snake could likely be. I cut into the woods near a large, thick bush to my left and attempted to make a semicircular bypass. I immediately found myself looking over the edge of a cliff. The way around would required walking a narrow ledge while hugging some large rocks situated at 70-degree angle to the ledge. No way. Plus there were no guarantees that I would not encounter another snake. I thought about making a detour to the right of the trail, but this area was thick with thorns and pointy things. I concluded that I just needed to take my chances with Scylla the snake. I considered the contents of my backpack. Would anything help my cause? I pulled out a towel to use as a matador’s cape in the event the snake lunged out at me. I had several items that could be used as a tourniquet in the event I were bitten. Thankfully, I had cell service on the mountain! 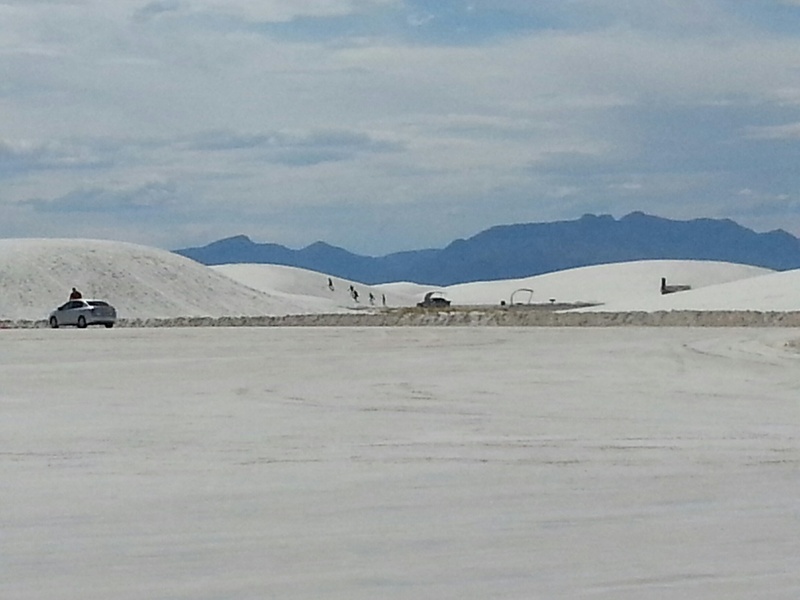 This was not the case at White Sands. 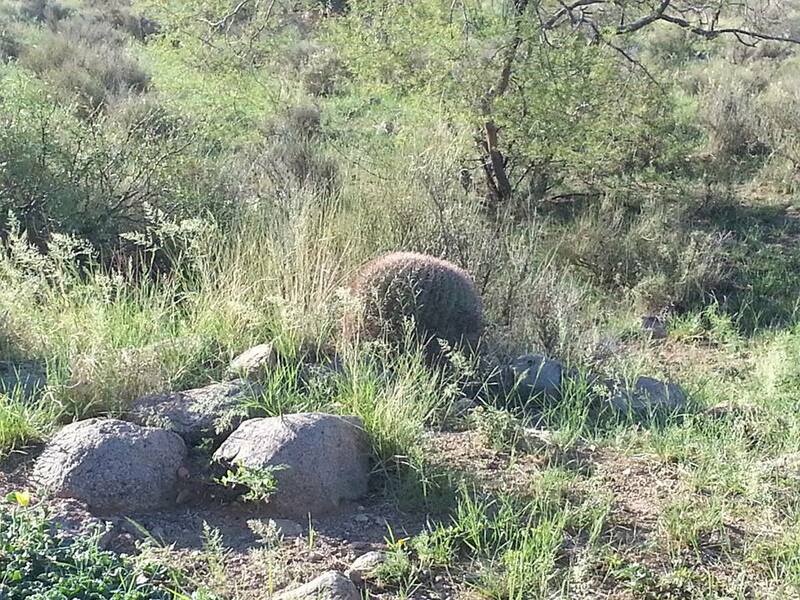 I began bowling softball-sized rocks down the trail ahead of me in the hopes of dispersing lingering rattlers. I dangled the towel out beside me with my left hand, held a rock at the ready with my right, summoned my courage, and carefully ventured into the danger zone. I started shouting “Yah! 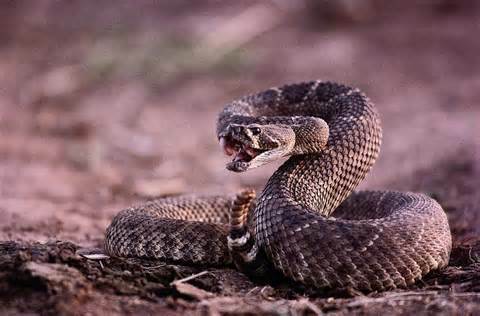 Yah!” and make as much noise as possible, just to be certain I wouldn’t take any trailside serpents by surprise. This continued until I grew tired of it; nevertheless, I kept my towel out for the remainder of the hike in case the need arose. I would learn later that the reason some people walked with sticks was to provide advance warning to unseen snakes ahead with repetitious pounding of the ground. Other people would clap their hands as they walked for the very same reason. The remainder of the descent was relatively uneventful. I pretty much retraced my steps, passing all the landmarks in reverse order, occasionally stopping to take capture the remarkable scenery with my phone. I passed the sticks I saw when I transitioned from the foothills to the mountain. This meant I was still 1.1 miles from my car. I had long since grown accustomed to the altitude, especially now that I was descending. Exertion gave way to exhaustion, and my left knee was bothering me. I sluggishly pressed on, anticipating cold water and juicy grapes in the car. Perhaps I would stop at Whataburger (pronounced “Water Burger”) after I was finished. I would probably need to ice my knee back at the hotel. As I traversed the slight negative slope of the foothills, I expected to see my car any minute, perhaps around the next turn or behind the next bush. After seemingly forever, I caught sight of the lot, which still looked like MILES away. I could see my red car and one other vehicle, appearing as matchbox cars in the distance. “You gotta’ be kiddin’ me!” I uttered under my breath. Eventually, I made it back. It actually took longer to descend the mountain than to climb, likely due to fatigue. The journey’s wear and tear on my body was about equivalent to that of running a half marathon at a competitive pace. I looked back at the ominous yellow warning sign as I passed it again. 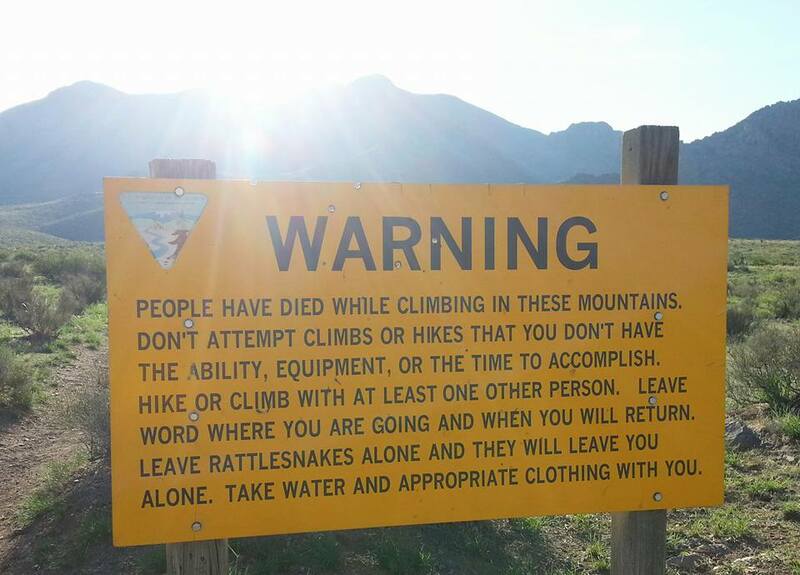 Fortunately, the rattlesnakes left me alone. I didn’t starve. I didn’t die. And I would have quite a tale to tell when I returned. This entry was posted on July 29, 2015 at 11:50 pm and filed under Narratives. You can follow any responses to this entry through the RSS feed.